Property Name and Established Hanging Plaque 2 Sided - - a stately property name sign features raised text and borders and a sandblasted HDU substrate with sandstone grain texture. 20" x 12" enhanced rectangle. Made in USA. Personalized with the property name or house name and the established (ca.) year you provide. Property name line holds up to twelve (12) numbers. ca. line holds the year in standard four-digit format as shown above. The abbreviation "ca." and the delicate accents are standard on this sign. Dimensions: 20"W x 12"H x 2". Color: green surface with white wording as shown in the sample. 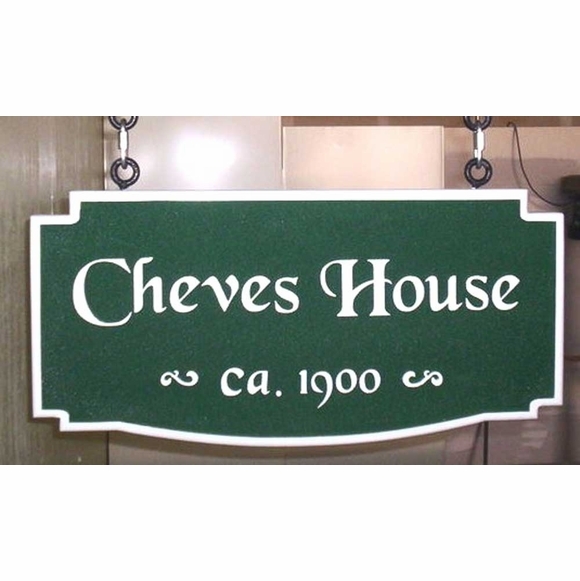 House name shown in sample sign: Cheves House.